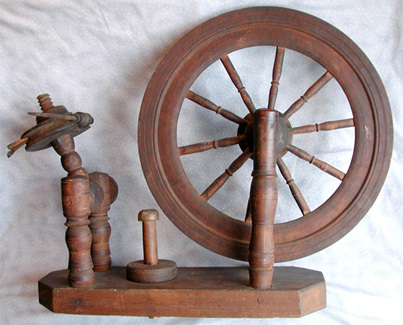 Spindle wheels are used for spinning cotton and short-length wools. A spindle wheel can twist the fibers much tighter than a flyer wheel since the operations of twisting and winding-on are independent of each other. Warp threads on a loom need to be tightly twisted to withstand the tension between the beams and abrasion from the reed. Tight twisting also helps the short fibers maintain integrity as a thread. 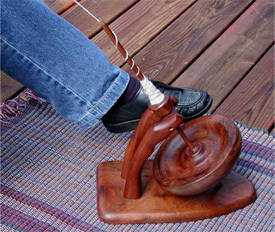 Spindle wheels are usually operated by hand rather than a foot treadle. These wheels were also easier to manufacture than the flyer assembly wheels. 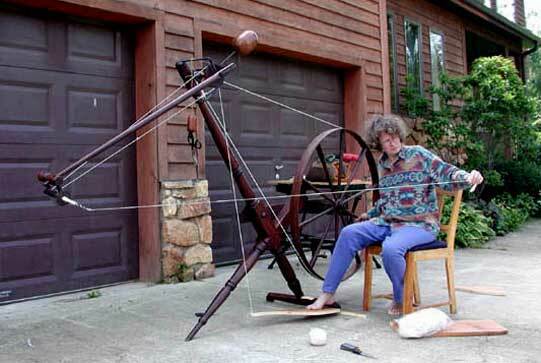 Elizabeth is shown here trying out the prototype treadle on her new pendulum spinning wheel. The wheel was missing the treadle when we bought it so Jim was in the process of designing a replacement. The wheel was purchased in Pennsylvania in 2003. This unusual wheel was manufactured around the time of the Civil War. Pendulum wheels and trolley wheels are referred to as Patent Wheels. 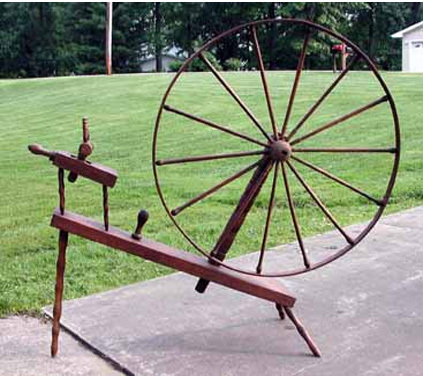 The Patent wheels allowed the spinner to remain seated while producing thread and yarn. The large ball of wood is a modification to replace the missing iron ball counterweight that was original to the wheel. The small wooden weight was removed. She has since taken the wheel on several show-and-tell demonstrations. On a good day a fine, long (not quite 8 feet) thread can be spun easily. This is the only walking wheel we have seen that has a turned bed; most walking wheels have a rectangular piece of timber for the bed. This item was acquired at the Flea Market in Ranger, North Carolina. It was missing it's original spindle, but that is easily remedied from our stash of parts. We think that the original wheel had only one upright to hold the spindle assembly. For some unknown reason a hand whittled support was added next to the original. The wheel even comes with it's own spinning finger (used to turn the wheel). Unfortunately, a previous owner glued the wheel together backwards, not understanding the operation of the wheel. The wheel remains a decorator item until we can figure out how to unglue it. 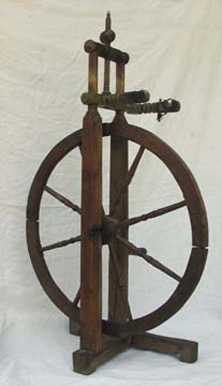 This walking wheel is unusual in that it has a raised platform on which the spindle is mounted. 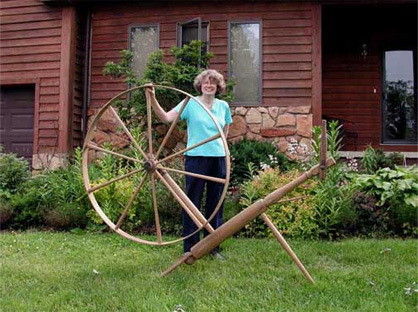 It was so named because of a photograph of a lady identified as Granny Greer sitting by a wheel like the one pictured here. This odd looking wheel gets its power from an external source drive belt. Sometimes mistakenly called spinning jennys, these wheels receive power via a pulley on the other side of the flywheel. A drive belt from the flywheel turns the spindle. A mushroom-shaped knob on the base would be dropped into a hole on a work bench to secure the wheel for operation. We have heard that a home spinner would have used a long loop of string attached to the cabin wall to operate this wheel, while a production mill would have used a water powered drive belt system. 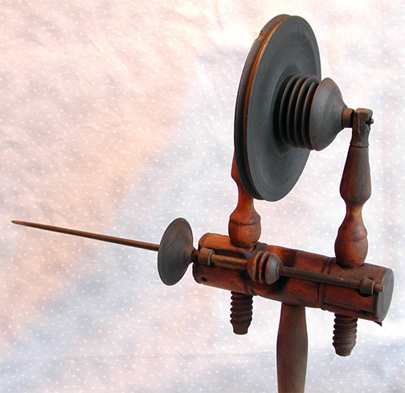 Below are several examples of heads used on spinning wheels The head below is a direct-drive head. A larger wheel will be connected to one of the pulleys. One turn of a large wheel like a walking wheel would turn the small wheel many turns. Some direct drive spindles have various-sized pulleys to provide more or less revolutions. If one wants to get serious about the different spindle configurations, they can recall their high-school physics classes. If the circumference of a large wheel and a smaller wheel are computed, the ratio of one to the other will give the increase in speed. For example, if the distance around a big wheel is 100 inches and the smaller wheel measures 1 inch, then for every revolution of the big wheel the small wheel will turn 100 times. This principle is the basis of all spinning wheels. Spinners may have a personal preference for the speed they desire based not only on their experience level but also on the material being spun. The spindles above and below are direct drive units. Both spindles require one upright from the spinning wheel's base. However, it can be seen that the top has a single piece of wood holding the spindle whereas the lower spindle has two turned pieces. 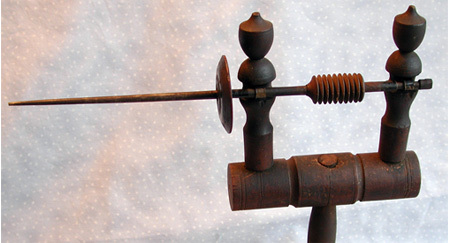 The spindle above is referred to as a "bat-head" spindle. The pulleys on the spindle are identical in diameter and are there to align the pulley with the big wheel to prevent the drive band from walking off the wheel. An interesting observation here is that the discs on these two spindles favors different directions. The spindle below is a miner's wheel. A drive belt from the spinning wheel powers the right-hand part of the two-sized wheel. The larger wheel then powers the spindle which is below. This design greatly increases the speed of the spindle. Calculations can be made to determine the increase as described above. Note: We keep saying "increase in speed" but in the end, speed is determined by how fast the spinner turns the big wheel. It is a relative thing. We are unsure what this wheel was used for but suspect that it was used not for spinning but for winding bobbins. It is missing its spindle or flyer and there is a hand crank on the back of the axle. It has a stamp on it "OPCN MURES"
This modern device is called a kick spindle. It is operated by the spinner's toe. It is as beautiful as useful being made from cherry wood.